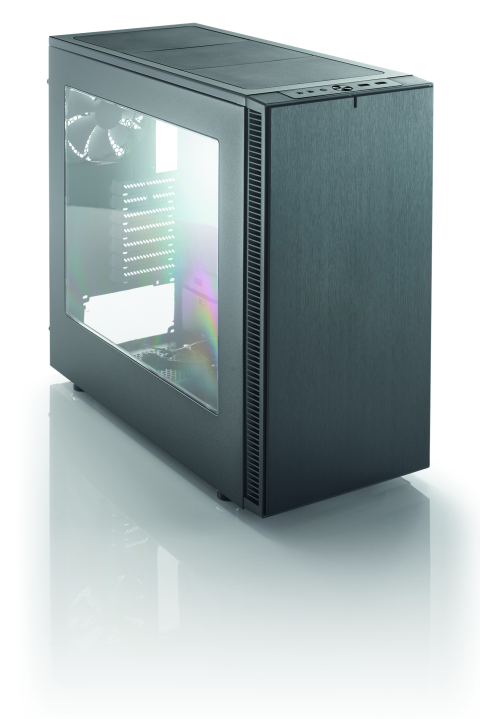 A good choice for builders looking for a midtower that supports liquid cooling. Superb build quality; liquid-cooling support; good price; good cable management. No fan controller; not much air flow for drives. We know what you’re thinking. Yet another Fractal Design Define midtower case looking just like all the others. Well, before you doze off, the Define S has a few tricks up its sleeve, not least of which is a price tag a few bucks lower than its predecessor, the Define R5. While it may look very similar to the R5, one difference is immediately apparent: The Define S has a solid front bezel instead of a door. The reason is simple, there are no 5.25-inch drive bays. In these days of digital content, the good old optical drive is needed less and less, meaning it makes sense to get rid of the bays to save space. From the outside, the Define S may look like all its siblings, but on the inside, it’s a completely different ball game. More than ever before, Fractal has designed the internal layout with liquid cooling support in mind. For a start, there are no conventional drive cages. We instead get three drive trays housed on the rear of the backplate. Each tray supports either 3.5-inch or 2.5-inch drives, while there’s also two more dedicated 2.5-inch trays to the rear of the motherboard tray. It’s very neat, but you can’t help thinking there isn’t going to be much in the way of cooling for the drives. Where the drive cages would normally be found, there’s a big, empty space. At least until you look closer. The backplate has been drilled for mounting a liquid-cooling reservoir (mounts are included) and the base can support many different types and sizes of pump units. There’s no real excuse not to have a very tidy setup. As for radiators, it comes as no surprise that the Define S can support the odd one or four. There’s room at the front for a rad of up to 360mm, regardless of thickness, while you can get anything up to 420mm long (with a thickness limit of 55mm for the longer lengths) in the roof. Plus, the back panel can house either 120 or 140mm units. There’s room in the base for a 120mm rad, but bear in mind if you go for this option that there’s a 165mm limit for the length of the PSU. The case also features Fractal’s ModuVent covers on the top panel. All of the covers can be removed to allow fans to be fitted. As an aside, the $75 nonwindowed version has a fourth vent in the side panel as well. As they say, the devil is in the details. It’s only when you take a closer look that you begin to understand why the Define S comes with a low price tag. For starters, there are only two USB 3.0 ports in the I/O bay—the R5’s bonus pair of USB 2.0 ports have gone. Also gone is any form of integrated fan controller, plus the side panels are back to being the notched variety, not the previous latched version. A really nice design touch is the small hole at the bottom of the mobo backplate, close to where the audio header on a motherboard is situated. It means that this is one case where you don’t have to drape the front audio cable across the front of the board—it just runs neatly behind the backplate, along with all the other cabling. Fortunately, despite the price tag, the Fractal Design attention to detail and superb build quality remain as high as ever, even down to the simple things like cable management.